New Delhi: Terming the Cabinet approval of the National Health Policy 2017 as a huge milestone in the history of public health in the country, Union Minister for Health & Family Welfare Shri J P Nadda said that it seeks to reach everyone in a comprehensive integrated way to move towards wellness. Shri Nadda added that NHP 2017, which is patient-centric and quality-driven, provides the much needed policy framework for achieving universal health coverage and delivering quality health care services to all at an affordable cost. The Union Health Minister stated under the guidance of the Hon. Prime Minister Shri Narendra Modiji, the Health Ministry has formulated the National Health Policy 2017, after a gap of 14 years, to address the current and emerging challenges necessitated by the changing socio-economic and epidemiological landscapes since the last National Health Policy was framed in 2002. Shri Nadda said that “The Policy recommends prioritizing the role of the Government in shaping health systems in all its dimensions. The roadmap of this new Policy is predicated on public spending and provisioning of a public healthcare system that is comprehensive, integrated and accessible to all. Further, it advocates a positive and proactive engagement with the private sector for critical gap filling towards achieving national goals. It envisages private sector collaboration for strategic purchasing, capacity building, skill development programmes, awareness generation, developing sustainable networks for community to strengthen mental health services, and disaster management”. The Minister added that the Policy advocates financial and non-financial incentives for encouraging the private sector participation. NHP 2017 seeks to promote quality of care, focus on emerging diseases and invest in promotive and preventive healthcare. It addresses health security and make in India for drugs and devices. The Policy has also assigned specific quantitative targets aimed at reduction of disease prevalence/incidence, for health status and programme impact, health system performance and system strengthening. It seeks to strengthen the health surveillance system and establish registries for diseases of public health importance, by 2020. It also seeks to align other policies for medical devices and equipment with public health goals. Elaborating on the salient features of the NHP 2017, Shri Nadda said that the Policy advocates a progressively incremental assurance-based approach. The broad principles of the Policy are centered on professionalism, integrity and ethics, equity, affordability, universality, patient centered and quality of care, accountability and pluralism. 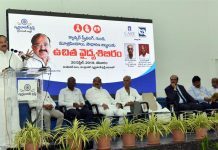 It aims to achieve the highest possible level of good health and well-being through a preventive and promotive health care orientation in all developmental policies, and to achieve universal access to good quality health care services without anyone having to face financial hardship as a consequence, Shri Nadda added. There is a sharpened focus to inform, clarify, strengthen and prioritize the role of the Government in shaping health systems in all its dimensions- investment in health, organization and financing of healthcare services, prevention of diseases and promotion of good health through cross sectoral action, access to technologies, developing human resources, encouraging medical pluralism, building the knowledge base required for better health, financial protection strategies and regulation and progressive assurance for health. The Minister also said that the Policy emphasizes reorienting and strengthening the public health institutions across the country, so as to provide universal access to free drugs, diagnostics and other essential healthcare. The Policy positions primary healthcare to be comprehensive and universal. It also seeks to ensure improved access and affordability of quality secondary and tertiary care services through a combination of public hospitals and strategic purchasing in healthcare deficit areas from accredited non-governmental healthcare providers, achieve significant reduction in out of pocket expenditure due to healthcare costs, reinforce trust in public healthcare system and influence operation and growth of private healthcare industry as well as medical technologies in alignment with public health goals. As a crucial component, the Policy proposes raising public health expenditure to 2.5% of the GDP in a time bound manner. It envisages providing larger package of assured comprehensive primary health care through the ‘Health and Wellness Centers’ and denotes important change from very selective to comprehensive primary health care package which includes geriatric health care, palliative care and rehabilitative care services. It advocates allocating major proportion (up to two-thirds or more) of resources to primary care followed by secondary and tertiary care. 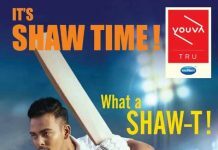 It also aspires to provide at the district level most of the secondary care which is currently provided at a medical college hospital. In order to provide access and financial protection at secondary and tertiary care levels, NHP 2017 proposes free drugs, free diagnostics and free emergency care services in all public hospitals. The Policy envisages strategic purchase of secondary and tertiary care services as a short term measure to supplement and fill critical gaps in the public health system. National Health Policy 2017 affirms commitment to pre-emptive care (aimed at pre-empting the occurrence of diseases) to achieve optimum levels of child and adolescent health. It envisages school health programmes as a major focus area as also health and hygiene being made a part of the school curriculum. 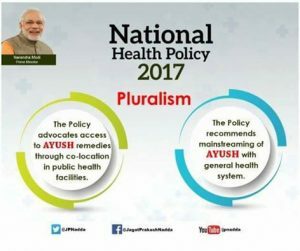 In order to leverage the pluralistic health care legacy, NHP 2017 recommends mainstreaming the different health systems: better access to AYUSH remedies through co-location in public facilities; Yoga would be introduced much more widely in school and work places as part of promotion of good health. Under a ‘giving back to society’ initiative, the new Health Policy supports voluntary service in rural and under-served areas on pro-bono basis by recognized healthcare professionals. It also advocates extensive deployment of digital tools for improving the efficiency and outcome of the healthcare system and proposes establishment of National Digital Health Authority (NDHA) to regulate, develop and deploy digital health across the continuum of care. There is also a strong focus on improving regulatory mechanisms recognizing the need to regulate the use of medical devices so as to ensure safety and quality compliance as per the standard norms. Government of India formulated the Draft National Health Policy and placed it in public domain on 30th December, 2014. Thereafter following detailed consultations with the stakeholders and State Governments, based on the suggestions received, the Draft National Health Policy was further fine-tuned. It received the endorsement of the Central Council for Health & Family Welfare, the apex policy making body, in its Twelfth Conference held on 27th February, 2016.